Couscous is something I had never heard or tried before in KL until Sylvia introduced it to us with her delicious couscous salad. 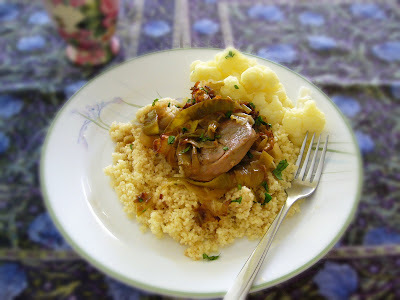 The taste of couscous is quite different...bland... it is made from semolina ...ie just like pasta. 250g couscous to 450ml of liquid... chicken stock or water. Spray a casserole dish with cooking oil. Browned the lamb on both side to seal the juice. Dish it out onto a plate. Saute the garlic and leek for a few minutes... Transfer the lamb back into the casserole dish on top of the sauteed leek and garlic. Mix the french onion soup with 1 1/2 cup of boiling water and pour over the lamb. Bake, covered for 40 minutes at 180C. Uncover and bake for another 30 minutes until the lamb is tender and the sauce thickened. Sprinkle with chopped parsley just before serving. For Couscous: Bring to boil 450ml of liquid. Add the couscous, and leave the heat on for 1 minutes. Turn off the heat. Cover. Let it rest for 5 minutes. Add butter and use fork to fluff it up.